The best about using reWASD is that you can achieve any SNES emulator controller support. Nintendo has released a lot of different consoles, and many of them have PC emulators now (DS, 3DS, Wii U, NES, SNES, Switch etc.). Here you will find Citra controller support preset that you can use on PC, ZSNES controller preset, DesMuME controller support layout that is fully customizable (as any other config in reWASD community), and you will also know how to use Xbox controller with Dolphin. You can create your own config from scratch, or modify this config so you could use controller with Citra in the handiest way. Wonder how can you do it? If you want to make your custom DeSmuME controller support config, you might need some help. Come see the detailed how-to about how to use joystick mapper for Windows. Making your NES emulator with controller support is as easy as pie! Note, that depending of the game controls may vary, and that this ZSNES controller support setting might require some changes. Now press Apply and test your ZSNES controller support layout in game! 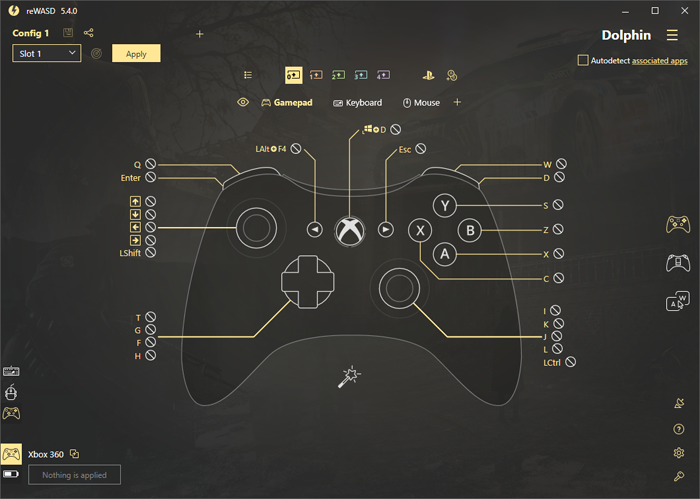 Feel free to change this config the way that will be handier for you to use Xbox controller with Dolphin. Or if you’d like to make one from scratch, come see the how to use Xbox One controller on PC to ease the creation process. Hope these tips were useful, and you won’t have any troubles using NES emulator with controller support. If you have any questions or suggestions, you can contact us in the comments below or via Facebook messages or reWASD Forum. And don't forget to follow our Pinterest page for more news!